If you believe all of the politicians and media nannies, we've all become too desensitised to the shocks that films and games have thrown at us these days. 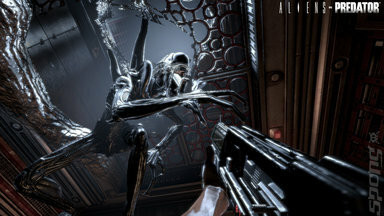 So, the first thing I asked myself when I saw Rebellion's Aliens vs Predator single-player – an update to its 1999 PC thriller of the same name – was 'is this still going to be scary'? The answer is yes, but for different reasons. There are three different species to choose from, each with its own storyline. Playing as the Marine, the set-pieces are markedly different to those seen in the game's 10-year-old brother; there's a fleshed out story that helps to create that sense of the unknown as you try to regroup with your squad whilst fighting Aliens. The AI has been cranked up so you never know where the monsters are coming from. And worst of all, you have a motion tracker – which doubles as your best friend and worst enemy. Tick-tick-ticking at any signs of nearby movement, the changing strategies of the Aliens can alert you to the wrong place just as they come at you from behind – in short, it's a real mind-screw. With beautiful graphics and an emphasis on isolation, limited ammo and limited health bars (no automatic regeneration for you, Spartan! 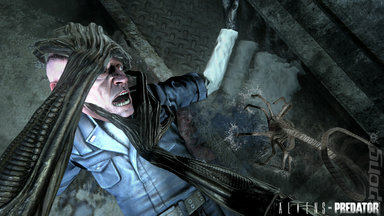 ), it seems that Rebellion are gunning for a scare tactic that brings the best of its classic PC game and elements of recent psychological horror together. After dying several times over at the hands of Aliens (they camouflaged with the walls! I thought they were murals! 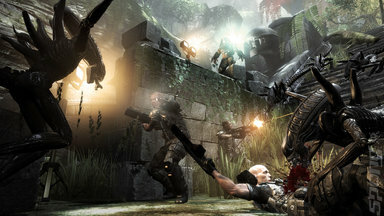 ), I spoke to the game's director, David Brickley about the direction the studio took with this game, how it differs from the 1999 original and working with a film studio to realise its vision for the franchise. SPOnG: Thanks for joining me again David. 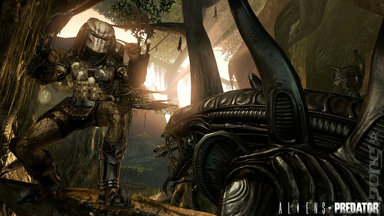 We already touched base on Aliens vs Predator a month or two ago now, and that was more the multiplayer side of things. What has your focus on the game been since we last spoke? 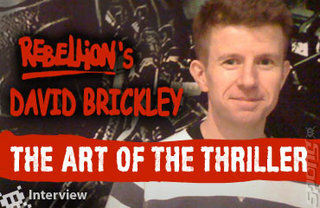 David Brickley: Since we last spoke it's all been about finishing touches, really. It was an interesting experience in Chiswick, doing the initial announcement and letting people have a go on the multiplayer. And it was a fairly unoptimised version, but I think the most gratifying thing about that day was just being able to surprise people. It was fun to see people start to get their heads around the question of species and strategy. We showed the game as-is on that day, and I remember saying “This is not over yet”. That was very true; I mean we're still playing it in the office, tweaking various elements and trying to figure out how to cope with certain situations better. It's always the way with games – you give people tools and options for play, and they surprise you all the time. The more QA that we did, the more we discovered as we noticed players were doing things we'd never even thought of before. I guess that's the most fulfilling thing about development, when you get to build your game by watching people play. And we have to make sure it's fair as well, at the end of the day. We want to make a game that anyone can jump into and enjoy instantly, but still have that underlying skill and strategy required to master. And I think we've hit something on that with these three very different styles of play. SPOnG: I did appreciate how you need to apply very different play tactics to be truly great with all three species. Was there anything specific that you learned from that last press event, and on a greater level during the QA process in general? David Brickley: The version we showed at the time was less legible than it is now. I mean there were issues at the time with animations, whereby you couldn't actually tell what the opponent was about to do to you. Which is rather fundamental when it comes to the melee attacks – you have to know if your enemy's blocking or light-attacking or charging a heavy attack, so you can respond in kind. The day in Chiswick was just very informative in general. We came out of that adding a bunch of little, subtle changes that can turn the whole state of play around – how long each round should be, how easily should we give you additional weapons, and so on. And even when the game's out it's going to be a learning process for us, but I think at this point we're happy in feeling we've set the balance just right.